Veterans for Peace, Inc. (VFP) is a global organization of Military Veterans and allies whose collective efforts are to build a culture of peace by using our experiences and lifting our voices. We inform the public of the true causes of war and the enormous costs of wars, with an obligation to heal the wounds of wars. Our network is comprised of over 140 chapters worldwide whose work includes: educating the public, advocating for a dismantling of the war economy, providing services that assist veterans and victims of war, and most significantly, working to end all wars. 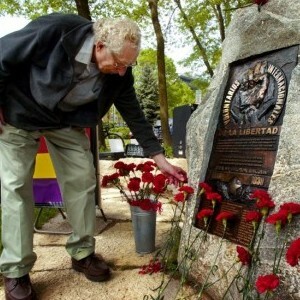 The Madison Chapter 25 of Veterans for Peace has grown to about 120 members and is named after member Clarence Kailin, who served in the Abraham Lincoln Brigade of American volunteers in the Spanish Civil War (1937-38). The Madison chapter includes veterans from World War II, the Korean War, the Vietnam War, Gulf War I (Desert Storm), the Global War on Terror, the Iraq War and one veteran of the Israeli army. Clarence Kailin, long-time Madison peace activist and social reformer, who was a founding member. Clarence died in late 2009 at the age of 95. We honor him by carrying on his name and making efforts to establish a more peaceful and justice nation and world. 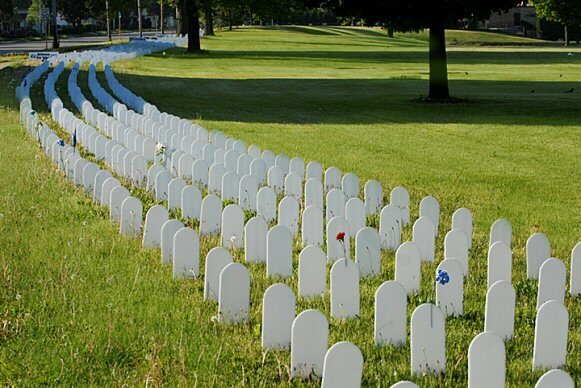 It is our fervent wish that we have no more wars from which we add to our membership. There are many opportunities to volunteer with Veterans for Peace. We table at the Dane County Farmers Market every Saturday during the market year (April-November), as well as at Juneteenth, Fiesta Hispana, Triangle Ethnic Fest, the Willy St. Fair, and other events. We encourage and participate in parades and demonstrations in support of our most basic democratic values and obligations to be an involved citizenry. 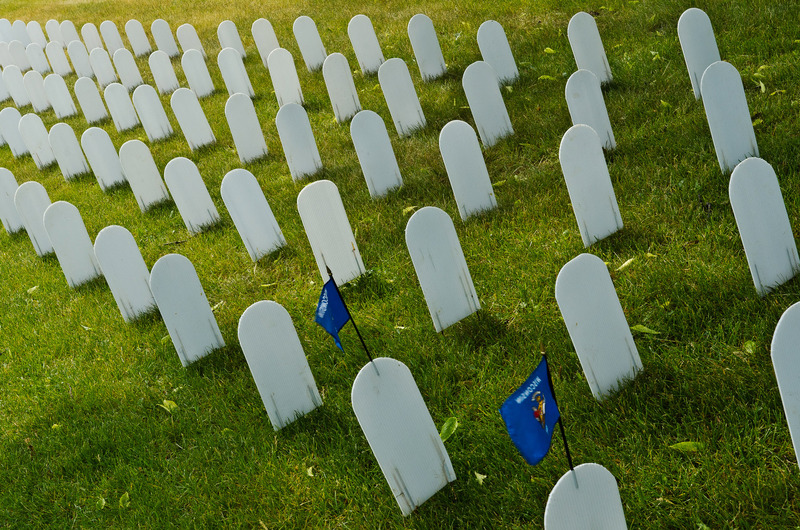 We set up over 5000 tombstone replicas (The Memorial Mile) at Olbrich Park on Memorial Day weekend to honor those who have died in in the wars in Iraq and Afghanistan. We engage in periodic funding raising (mailings, not phone calls) to raise dollars that help us in our mission. 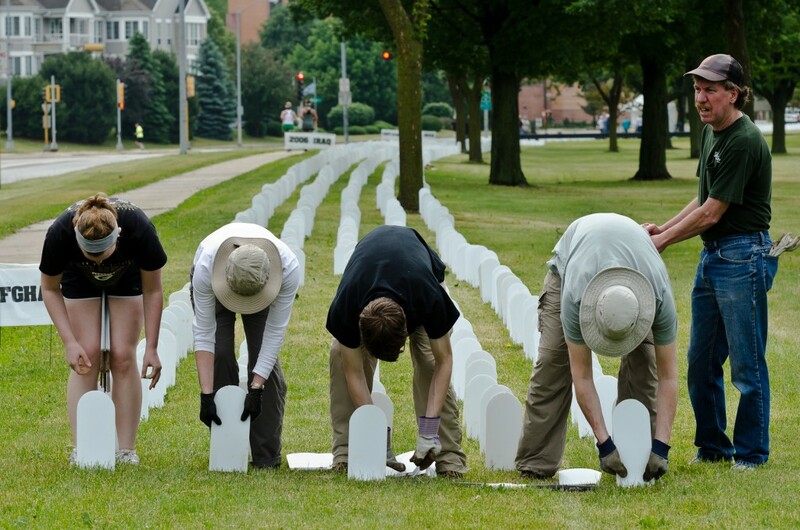 VFP members and volunteers install the Memorial Mile, May 2011. We also provide information and education at the request of legislative committees at the state and federal level on issues related to veterans and peace. One of our former members has established peace parks in My Lai, Viet Nam, and has initiated several self-help loan programs in Viet Nam to assist Vietnamese women starting small businesses. Are you interested in performing an student internship with VFP? We are open to ideas and will make suggestions on how you may help the cause. If you are a student, have your teacher contact one of the board members for further discussion. We welcome volunteers! Please contact us through the email or phone number listed . VFP is a 501(c)(3) non-profit. Contributions are tax-deductible under IRS Code. We use donations to sustain our activities, award peace scholarships to area high school seniors, pay for printing/mailing costs, etc. Without our supporters, our work would be difficult if not impossible to sustain. We thank all those generous supporters for their past contributions. All contributions are gratefully acknowledged.